PERSONALITY: Dudley Senanayake's ninety-fifth birth anniversary fell on June 19. I first met him in 1967 when he was serving as Prime Minister. I was then a university student and went to meet him as part of a group of student representatives from the United National Party Student organization. That year, student protests were a frequent occurrence in universities across the island. The Prime Minister called our group to meet him as part of his effort to solve student problems by learning their views on the prevailing situation. After this first meeting, I continued in close association with the UNP and became close to the UNP leadership during reorganization activities after the 1970 election defeat. By this time, I was a member of the Working Committee of the All Ceylon U.N.P. Youth League while serving as an Assistant Lecturer in Economics at the University of Sri Jayewardenepura, then known as the Vidyodaya University. In 1971, Dudley appointed me as the Acting General Secretary of the All Ceylon UNP Youth League. I was fortunate to maintain this close relationship right up till Dudley's death on April 13th, 1973. I feel that neither historians nor political analysts have adequately assessed or understood Dudley's politics. When D. S. Senanayake died in such an unexpected manner in 1952, most people expected Sir John Kotelawala to be appointed Prime Minister. However, most individuals inside the UNP including J. R. Jayewardene wanted Dudley to take on the position. This was why he accepted the post. Yet with allegations that he became Prime Minister through the back door, he immediately dissolved parliament and called for fresh general election. His decision proved to be the correct one. The UNP's 1952 election victory was the most fitting indication of his popularity. His victory was even superior to his father's election victory in 1947. The UNP won fifty-four of the ninety-five seats in parliament. Even more satisfactory was the response from the Tamil community in Jaffna. While the Tamil Congress, which had been associated with the UNP in the preceding few years, won four seats, their rivals, the Federal Party, won only two. The Federal Party leader, S. J. V. Chelvanayakam, even lost his Kankesanturai seat to the UNP candidate, Mr. S. Natesan. However, the government Dudley formed in 1952 was short-lived. In the face of ill-health and the situation that arose after the 1953 Hartal, he resigned his post. After his resignation, he continued to serve as a Member of Parliament, but when the 1956 elections came around, he did not contest. His unexpected and premature retirement from politics was one of the main reasons for the UNP's huge loss in 1956. The party won just eight seats and even giants like J. R. Jayewardene and Ranasinghe Premadasa and many cabinet ministers lost their seats in parliament. Even though Sir John was able to retain his seat, the UNP's voice was really heard in parliament in those years due to the efforts of an honest gentleman-politician, M. D. Banda, who most Sri Lankans have now forgotten, and two other members, Col. C. A. Dharmapala and E.L.B. Hurulle, who is fortunately still with us today. After the 1956 defeat, the key decision-maker in the UNP was J. R. Jayewardene. He was supremely skilled at organization. Nevertheless, even he knew that his image and skills alone were inadequate to win back the confidence of the people. Therefore the UNP invited Dudley to rejoin politics and once again become the leader of the party. At that time, he was not even a Member of Parliament. At the Party Sessions of March 1958, the U.N.P. led by Dudley decided to accept Democratic Socialism. "We have no desire to make the citizen of free Ceylon a helot or slave of the State," Dudley said about Democratic Socialism. "We have no ambition to take over the ownership of his land or his factory or his cottage industry, if he is taking part in the national endeavor to raise the standard of living. Private effort need not be destroyed on purely doctrinal grounds. All development needs not be surrendered to the State. That is the totalitarian way." The UNP's victory at the next elections in March 1960 showcased the people's acceptance of Dudley's leadership and J. R. Jayewardene's strategy. Although the UNP received the highest number of seats as a single party, this was not sufficient to form a government. Therefore it held discussions with the Federal Party to gain its support. However, due to the F.P. 's impossible demands, Dudley decided the decision should be laid again in the hands of the people. This was why elections were called again in July 1960 just four months later. Although the UNP's vote bank increased in the July elections, the first-past-the-post system, which prevailed at the time, and the SLFP's no-contest pact with the LSSP and the Communist Party, ensured that the SLFP was able to form a government. This time, the SLFP was led by Sirimawo Bandaranaike, whose husband, the late S. W. R. D. Bandaranaike, had been assassinated just a few months before. The tearful speeches Sirimawo made at election meetings across the country played a large role in the SLFP's victory. By the time of S. W. R. D.'s death, the country's economy was in shambles after communal riots in 1958. These were the first communal riots of independent Sri Lanka. The alliance government was also falling apart as many of the leftist parties in the coalition had withdrawn from it. In light of this, S. W. R. D.'s death was actually a blessing in disguise for the SLFP Had it not occurred, the results of the election would have been far different. The bullet that killed S. W. R. D. gave new life to his party. As a result of the July 1960 election, Sirimawo became Prime Minister and Dudley became the Leader of the Opposition. The LSSP joined the government in 1963. Then the government attempted to control all print media through the state machinery. It was obvious that the government was gradually leaning towards a more dictatorial rule and Dudley and J. R. launched a campaign to defeat it. In parliament, they were ably supported in this effort by Philip Gunawardena and W. Dahanayake, among others. Outside parliament, this endeavor was carried out by Esmond Wickremesinghe, the father of the present UNP leader, and N.G.P. Panditharatne among other party stalwarts. Soon, with the cross-over of fourteen government parliamentarians, including C. P. De Silva, the Leader of the House at that time, Sirimawo's coalition government collapsed. With the fall of the government, new elections were called for March 1965. Even though the UNP under Dudley's leadership won the most number of seats in the elections, this figure was inadequate to form a government. Hence, the UNP enlisted the support of the parties, which had helped it defeat Sirimawo's government. Thus, a national government was formed with Dudley as the Prime Minister. In this extraordinary government, men with completely opposing views were able to work together under Dudley's astute leadership. K. M. P. Rajarathne, the symbol of Sinhala extremism, S. J. V. Chelvanayakam, the symbol of Tamil extremism, and G. G. Ponnambalam, who had once asked for fifty-fifty representation in parliament, were all in Dudley's government. Both the "Father of Socialism" in Sri Lanka, Philip Gunawardena, and the greatest proponent of the open market economy, J. R. "Yankee Dickie" Jayawardene, worked in tandem with each other in the same cabinet of ministers. Not only did Dudley unite these opposing viewpoints within a "hath havula," but he also kept this government in office for the full five years of its term, the first government to do so since independence. Dudley, who had accepted the role of Prime Minister so reluctantly in 1952 and let go of it so easily, had now proven his magnificent skills as the head of the government. In fact, Dudley was the last government leader who had parliamentarians elected from both the Southern and the Northern provinces within his cabinet. Further, after Dudley's government, no Members of Parliament elected from the Federal Party or the Tamil Congress ever sat in government benches again. Before the 1965 elections, Dudley had negotiated with the Federal Party to reach a compromise to resolve Tamil political grievances. Dudley and Chelvanayakam had come to an understanding to form District Councils, which would decentralize the country's administration. In 1968, Dudley presented a parliament Bill, which would allow these councils to be set up. The Bill would need to be passed in the House of Representatives for the councils to become a reality. However, the opposition, including the S.L.F.P. and the leftist parties, gave no ear to Dudley's explanations and refused to even consider the Bill. There was opposition to it even from within the U.N.P. In the end, Dudley withdrew the Bill, concluding that, "It is evident that the majority of the people of this country do not want the Bill, and it is not my intention to force anything against the wishes of the people." However, Dudley was able to pass an Act of Parliament in 1966 to allow the Tamil language to be used as the official language in districts where Tamil-speaking people were in the majority. Even this attempt was opposed by the SLFP, the LSSP, and the C.P. with charges of "Dudleyge bade masala vade." The protest organized by the opposition saw the sacrifice of the life of a Buddhist priest. It was no wonder that the Tamils saw the reluctance of extremists to allow them to use their mother tongue in dealing with government matters. The events that transpired after the 1965 elections also showcased Dudley's modesty. 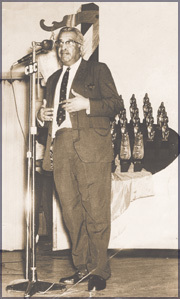 Dudley and the UNP were able to defeat the previous SLFP administration largely due to the support it garnered from the Leader of the House, C. P. De Silva, and his colleagues, who voted against the government in the Press Bill of December 1964. After the ensuing election victory, Dudley sought out C.P. and offered him the post of Prime Minister. "What nonsense, it is you the people are waiting for," C.P. responded. "But if you wish to give me something, please give me my former portfolio." Dudley was not only modest enough to believe the people would so easily accept anyone other than him as the Prime Minister, but also never forgot someone who had once made a sacrifice. In 1966, with the world rice shortage and escalating prices, Sri Lanka faced a crisis in the importation of its staple food. In response, Dudley launched a food production drive that particularly aimed at increasing rice production. This was the beginning of the famous Green Revolution in Sri Lanka. It was the most successful project launched during the 1965 to 1970 era to revolutionize Sri Lankan agriculture, especially traditional paddy cultivation. The Green Revolution almost realized the country's dream of self-sufficiency in its staple food. In just a short span of five years, it increased the income of those involved in paddy cultivation and not only doubled the amount of paddy produced in the island, but also the average yield per acre. The total paddy production in the country surged from 36.3 million bushels in 1965 to 77.4 million bushels in 1970. The Green Revolution also improved the quality of life of paddy farmers. Paddy was no longer grown on subsistence level only for the consumption of the farmer. Instead, the introduction of new technology produced an excess, which was placed in the market. It was this Green Revolution based on scientific agricultural research under the leadership of Dudley that became popular as the "Food Drive," which was ably implemented by M. D. Banda, Minister of Agriculture. However, with the change of government in 1970, Dudley's green revolution lost its direction. India, which had also commenced a green revolution during the same time, was able to continue it even with changing governments and rose in economic prosperity on its shoulders. However, Sri Lanka's Green Revolution floundered until the 1980s. The writer is Former Minister of Human Resource Development, Education, and Cultural Affairs and the present U.N.P. Organizer for Kolonnawa.